But I was excited to attend the wedding, for several reasons. 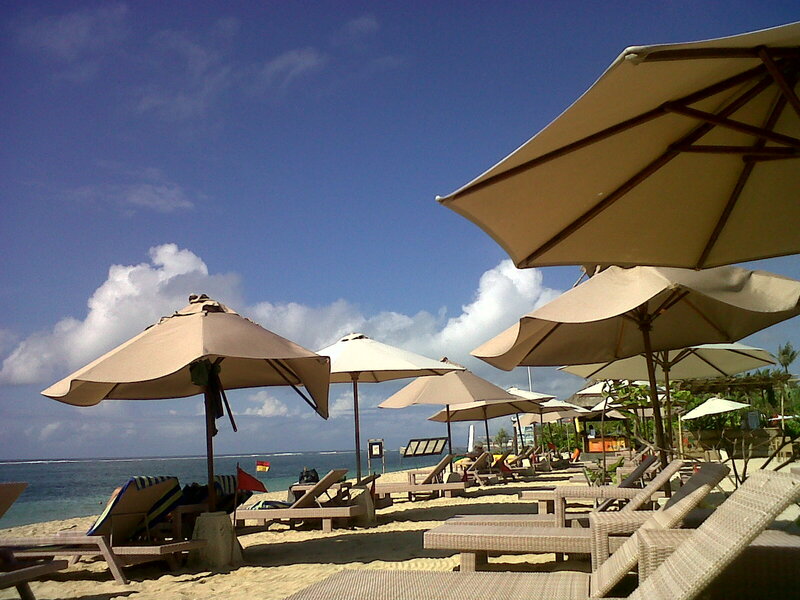 First, it was held in St. Regis, Nusa Dua, Bali – I’ve never been there and I was desperately in need of having a getaway. 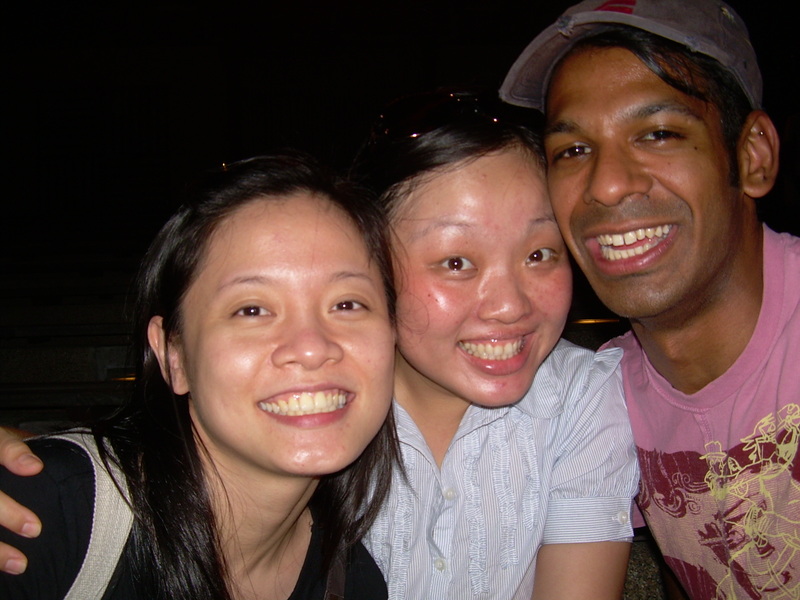 Second, Feli was one of my closest friends during Perth year – back to 2004, so I really need to go and share the happiness with her. 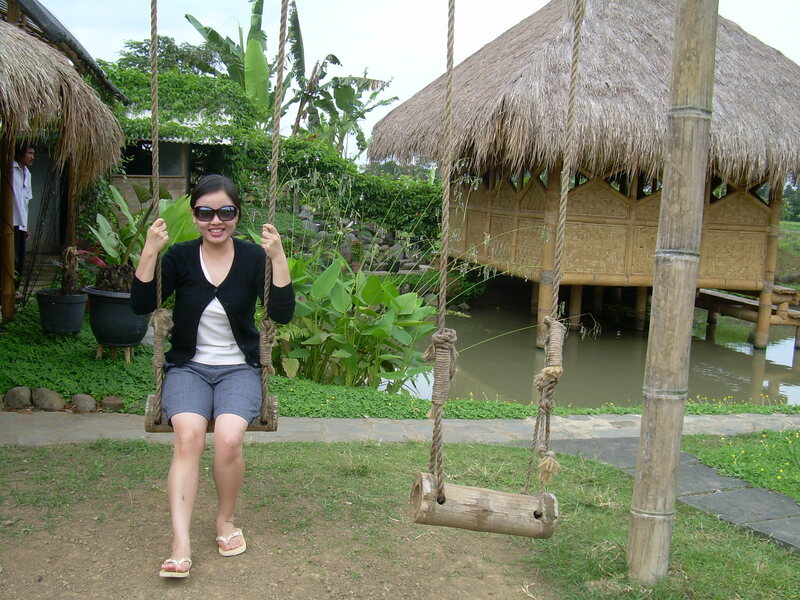 Third, I simply wanted to go, because my last Bali trip was to Ubud Writers and Readers Festival on 2007! So, after waiting for a while, Sammy – a good friend from Malang – finally picked me up and we enjoyed a ride with his motorbike. First destination was Novotel Hotel, Nusa Dua to drop my belongings. The good thing happened when he dropped me there, we got a free invitation for a bite at Pause Cafe. Thanks to Bage for his courtesy! What’s next on the menu? FlapJack! – photos coming soon! It’s the D-Day! I was so excited with all the preparation and most of all, with the wedding day. 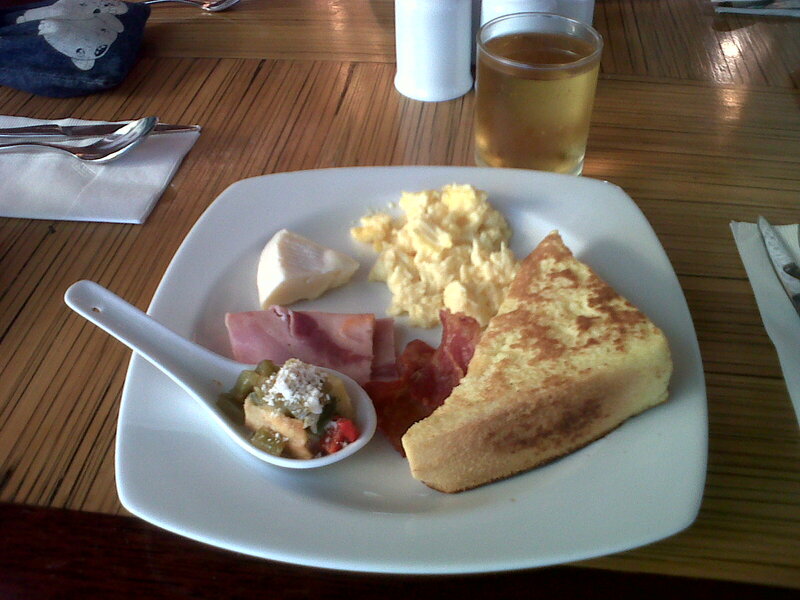 In the morning, I had a great breakfast time with Cindy – another friend from Perth as well. Then, to make myself feel ‘in a holiday mood’ – I went to the beach and had a moment of sunbathing! It was awesome. Novotel Hotel has its own private beach for the guests. And then, the wedding party begun! 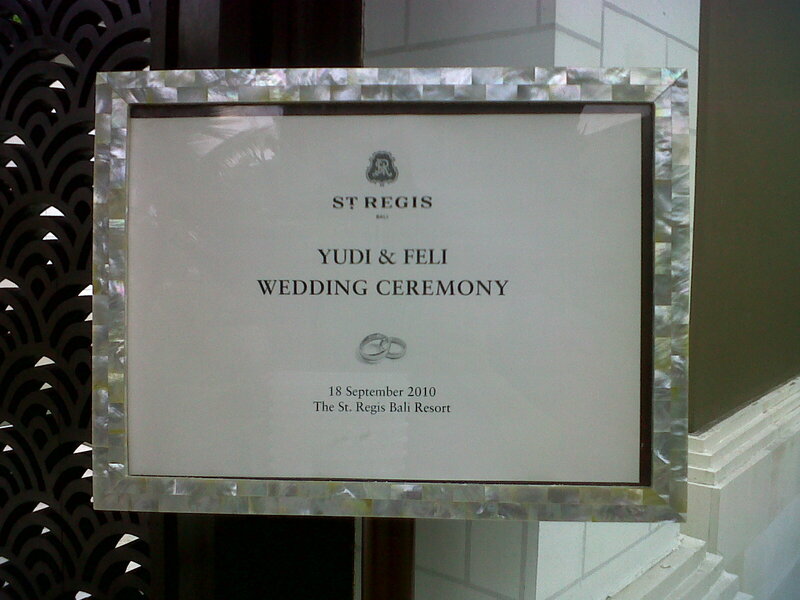 The party was started at 6pm and prior to the celebration, was a wedding sacrament at St. Regis’ chapel. The food was superb, but the fellowship was above all. Third day – Time to go home! Bye Bali … for now! I will be right back for a longer getaway experience! It was another a-5-day trip by myself. The main intention was to attend Andrea Wang and Mark Choon’s wedding. But the side intention was also Fun! I met up with old friends, ex Morons, and able to spend time with Gavin Nicklette! A wonderful best friend from Perth. After a long pause of traveling abroad, I felt the sense of awkwardness on this trip. My mom was busy warning me on, because she looked at my slow pace of moving and packing. I got everything done anyway, even though I had to wipe my just-done nails, because I screwed them up while scrolling and pushing the code on my suitcase. I arrived 2hrs before my flight took off. Thank God, the process was a piece of cake and I got this free fiscal fee, because I am a student, so I can include my name as dependent under my father. Well, it’s a good thing being a student. Then, after 30mins of delayed and unheard the instruction to fill immigration card (the most stupid thing!!!) 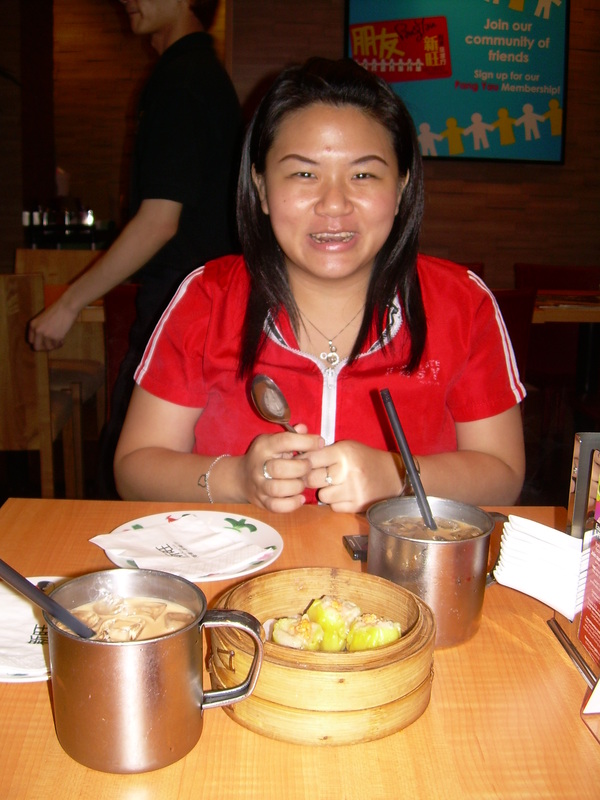 I could meet up with Anny Junita, an ex-classmate, who’s now working as a stewardess. We talked a lot on our way to her condo and long hours after that. We went to bed at 1am, after a long search on bus route. She helped me to search the right bus number for my appointment on Tuesday. She shared a lot on relationship matters, a field which I don’t master. I listened to her and I got what-so-called enlightment, in the field of building relationship. She never stops reading books with relationship topic and eager to write her own book. 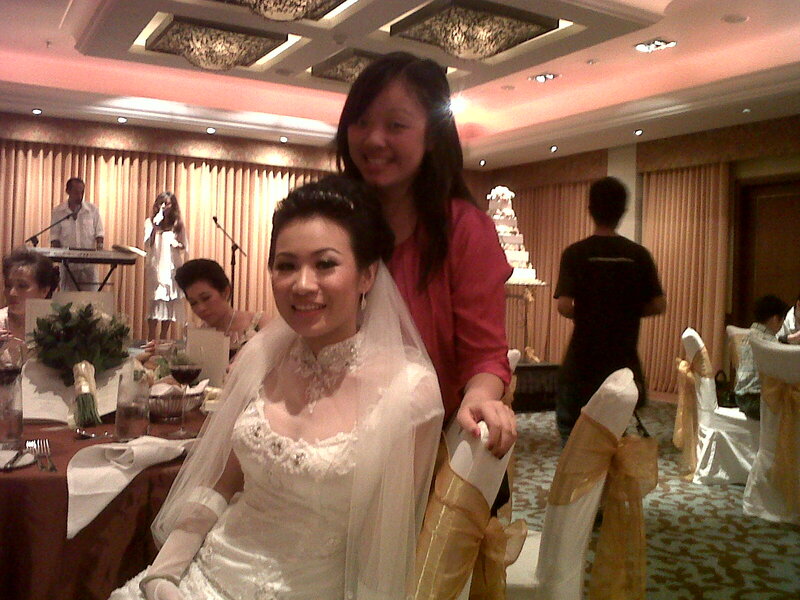 She is now preparing her wedding with Michael, another ex-classmate. I really wish them all the best. This day was started with breakfast together with Anny at Bugis Junction. We had this Korean dish. Mine was normal bimbibop, while Anny had her hot stone bimbibop. 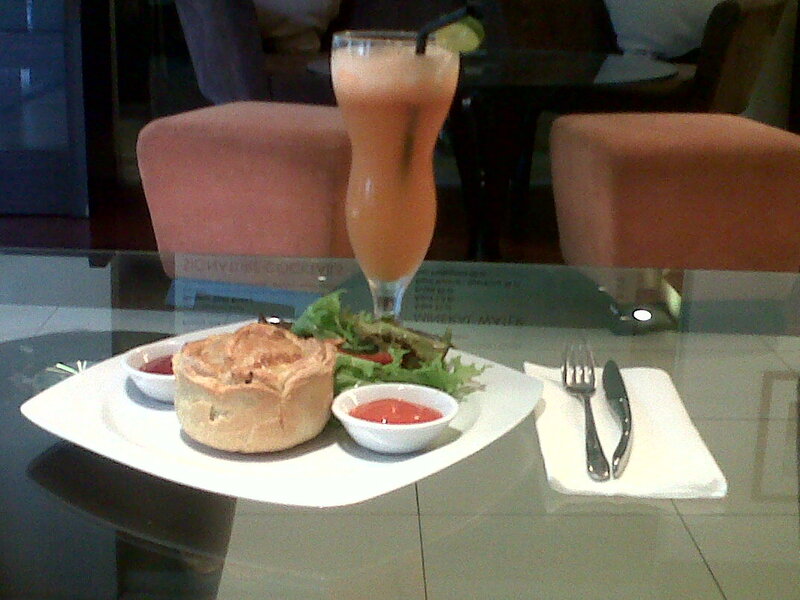 The food was nice and even nicer for me, because Anny treated me! She was just too nice! After being fueled up, as always, I look for bookstores. And this time was Bras Basah Complex. Time that limit my movement brought me something good, in which I didn’t have enough time to browse and search around. At least, I found a few books for myself and others. I found a cheaper version of Mitch Albom’s latest book. So, without hesitation, I bought it. Then I rushed to Buona Vista MRT, because I had an appointment with Shona Lowes, an expatriate psychologist from UK, who’s now working at Rochester Park, an area with foreigners as majority. disappointment in her voice (I am not being a supernatural person) when she said that she couldn’t help me out. But in the midst of that uncertainty, she still helped me on finding her connections at hospitals and clinics. She said that she will get back to me. So, now I have my strawberry milk ice at Novena to ease my feeling .. I am now in front of St. Clement Pastoral Care at Novena Church. Many people gather in front of the church. Some come with their family, others by themselves, just like I do. I am happy because I could buy daily reading bible 2010 at reasonable price! I am thinking to myself, what will Catholic church be? Will it be able to spread its wings bigger and love many more people? (I pray it will be done!). I also think to myself, whether this beautiful church will be able to deepen the faith and love of Catholic people… Because I love being a Catholic and nothing can change my faith. I see a young man sits in his formal suit. He takes out a book, which look like a daily reading. He takes out that book carefully and started to flip the pages. Within seconds, he is into the book. Next stop, Orchard at 1900 with Sisca. The dinner took place at Ion. The place is nice and the food has Singaporean taste (a.k.a tasteless compare to Indonesian food). We talked a lot about living in Singapore and relationship matters. She said that the older we grow, the deeper the topic that we choose. She’s right. On my way home, when I was in the MRT, I saw young couple. They were incredibly fall in love to each other and showed it physically. They hugged and physically attached to each other, as if glued to each other. I tried not to stare at them, but sometimes I just couldn’t help myself. Well, I have a different point of view of showing affection publicly. It’s my second day of walking this city by myself. I am now having my brunch at Bugis Junction (again). This time the menu is Chicken Rice! 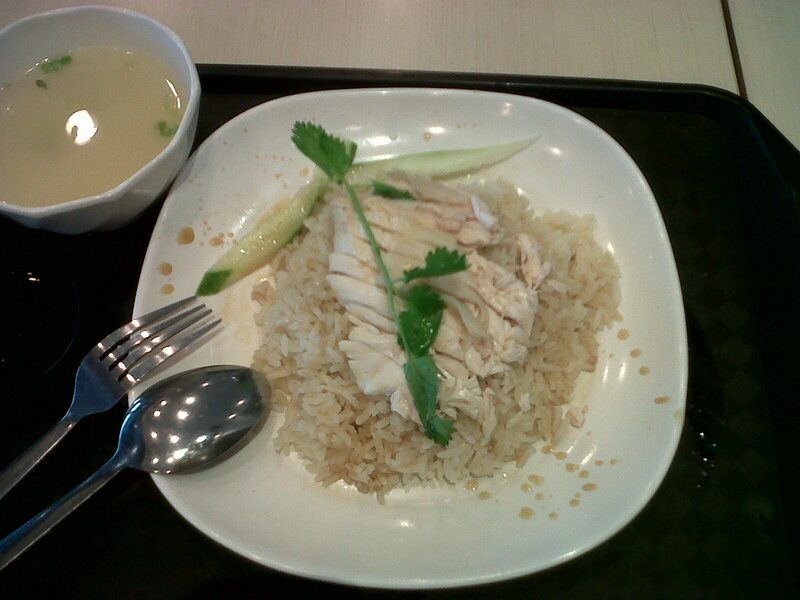 I just love the taste of Chicken Rice here in Singapore. Not much happenings at this hour, many stores are still closed. In the MRT that I took to get here, I saw another young couple (not yet a couple, I guess) stand in front of me. The man treated the lady so nicely. At one time of stopping, the train stopped so hard and many passengers were grasping hard onto the handle. This young lady didn’t have a handle to grasp, so she was about to fall. But the young man grasp her bag and hold her from falling down. Since then, everytime the train was about to stop, he would automatically grasp her bag. I think this simple act speaks more than words. What do you think? I also bought a few book as gift for my friends. A hello kitty box for my gorgeous niece, bracelets for me and my sister-in-law. I also bought a party handbag for myself. Not to forget 2 watches for my brothers. I quit when both hands were full and I couldn’t bring more items. I decided to go home and have a rest. Well, I had a nap for about an hour. 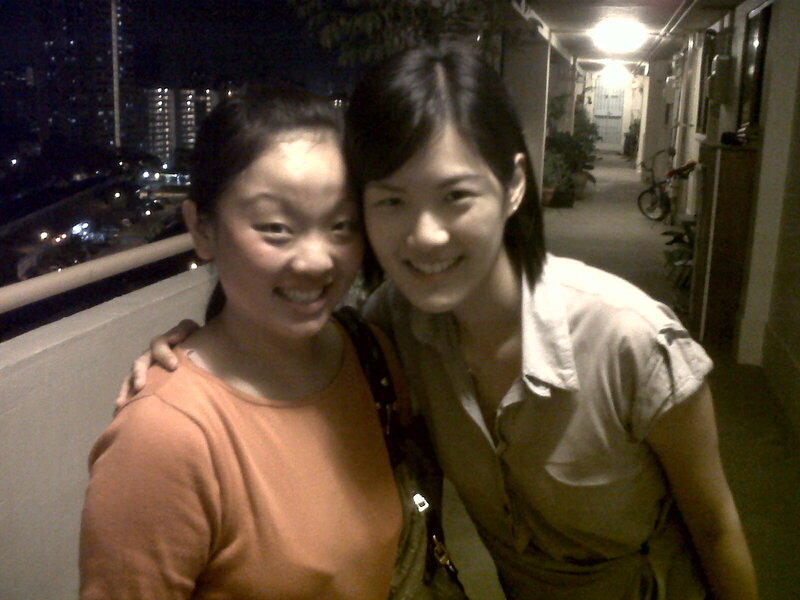 I was sitting in front of Germaine’s flat at Ang Mo Kio. The whole journey was a new adventure for me, in which I have to look at the route carefully and never hesitate to ask around whenever I feel lost. So, after took 2 MRT routes and short trip with bus, I arrived at her place. About 7pm, Simon (her husband) came with Isabelle (their daughter). We never met before, so he was checking whether I was Cicil or not. He told me that Germaine would be a little bit late and asked me to wait inside. While I was waiting, I saw Simon took care of Isabelle. He heated up her dinner, played with her kitchen set together and talked with me. He shared his story about living this life as a parent. He said that he get used to the routine and that’s all. All the chores must be coordinated between him and Germaine, so everything would be done accordingly. I could see that he had been doing a good work. Isabelle was so close to him and clingy at some point. Then … Germaine came home! It was great to see her again. As I predicted, we shared a lot of stories, about back then at Perth, her careers, the ups and downs and most of all, she supported me to work as a psychologist in Singapore. We were busy lining up the stories until time hit 2130. So, this day ends in a good mood ..
Gavin came this morning at 7. But when we couldn’t catch up until about 4pm. Right before we met up, I had a great lunch session with Anny, in which we had plenty plates of sushi and the side dishes at Nihon Mura. I just love them all! Then .. The long journey of trying to find Gavin has just begun. 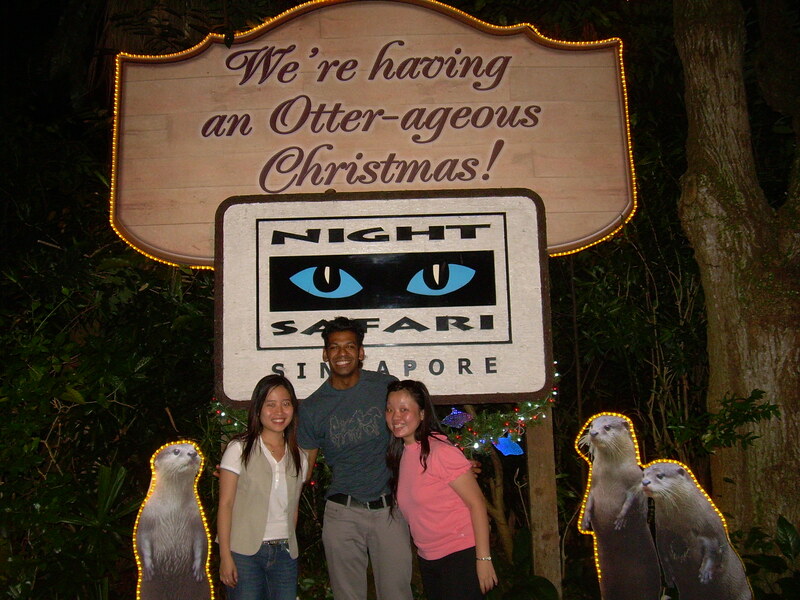 We had this miscommunication several times and finally we met up in front of Wisma Atria at Orchard Road. Anny and I accompanied him to have his what-so- called lunch at Food Republic at Takashimaya. Shopping was next on the list. We went to Takashimaya and Lucky plaza. Gav got his shoes and I got some presents for people back home. Then, we went off to Vivocity. Anny insisted to see Songs of the Sea. And she was right, the show was amazing! We had a great show on water fountain and laser game. We really had a great time together. We went back to Vivocity after the show and enjoyed our supper. It then followed by a surprise given by Andrea! She came from Serangoon. She was one calm bride-to-be. She looked very casual and showed no sign of anxiety, which was good. On our way back home, Anny taught Gavin on how to read the MRT map and helped him to get to Bugis Junction for a shopping the next day. We laughed soooo hard and we were so crazy about teaching Gavin. A lady who sat in front of us and she was smiling all the time. She never looked away from us. We had another blast day! I’ve spent half of this day by myself, because Gavin was overslept. He didn’t hear his phone ringing or his text beeping at all! But, it was okay. I had a great time by myself. I bought stuff as well today: CD + DVD package of Paul McCartney Live Concert at NY for my Dad – bag of Famous Amos for my best friend, Edwin – Apple speaker for myself! I was browsing around at the bookstore and fighting against myself of not buying books again. I won! I didn’t buy anything at the bookstore. Gavin and I continue the journey to Orchard to meet up with Susan, another friend from Perth. Because we wanted to give Gav a try on Asian food, we decided to bring him to Indonesian restaurant. It was a good choice though! Gav took photos of many forbidden signs from the bus and many other public places. Singapore is very famous with their forbidden signs, on simply everything. 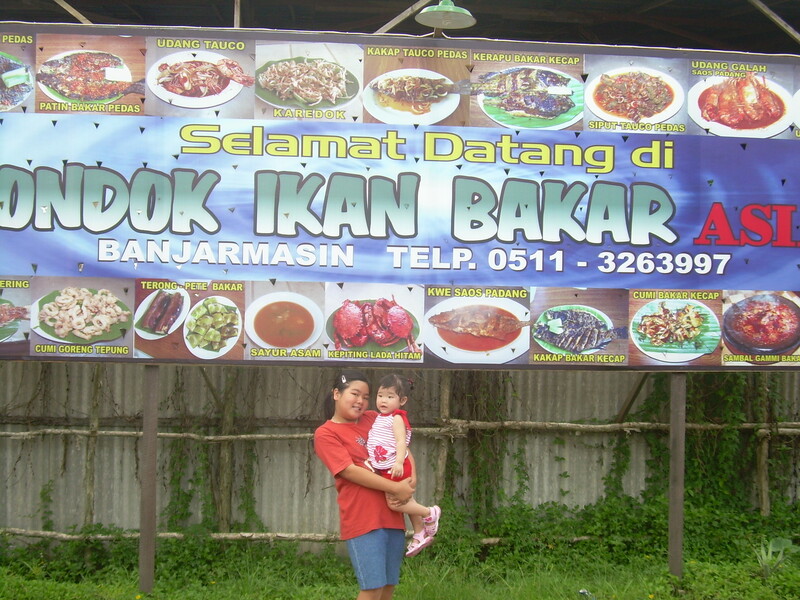 Yes, I had a short trip to Banjarmasin, South Borneo last March 2009. It was awesome, for I’ve met my family and relatives, catch up with the latest gossips and looking around for food. The main idea of that trip was to visit the family graveyard. It is a Chinese traditional ritual, which has to be done about a month after the Lunar New Year. So, yeah we visited the graveyard at first. 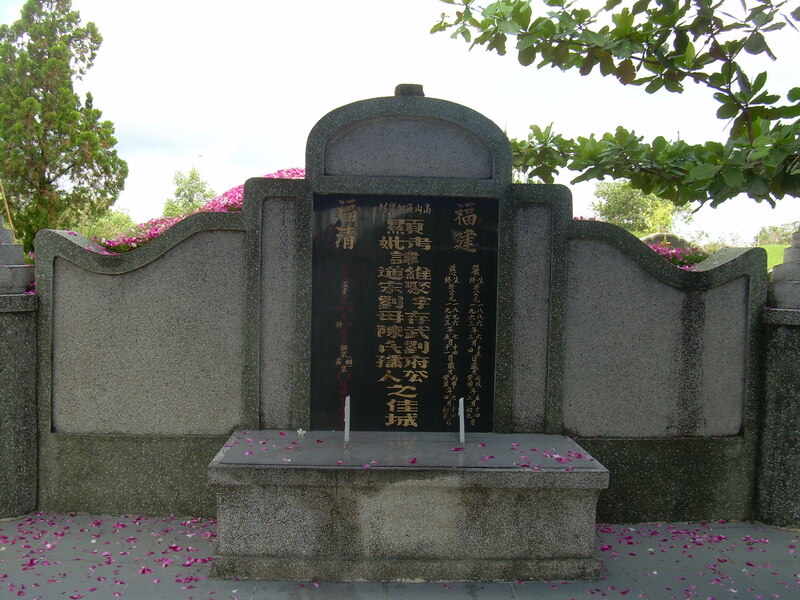 Me, my mom, sister-in-law, my niece and my aunties went to the graveyard straightaway from the airport. Then we met with the rest of the family. It was not a big reunion though, only about 80 people. Well, for my family 80 people are just a few! The ritual started by praying together in each site of our family member and then spread out the roses on the site. It is actually a way to respect our loved ones who had gone before us. But after all, it was a great lunch time together! Still on the first day, after finishing our lunch, we went back home (my Grandma’s) to prepare for the dinner. Actually it was meant to be a small reunion of our family. And guess what, it was a great night to be together! Even though not all of our family could come, the celebration was meaningful. We haven’t had a gathering like this, since the last reunion on 2006. There were 3 sections that night: men, women and children sections. Massive! 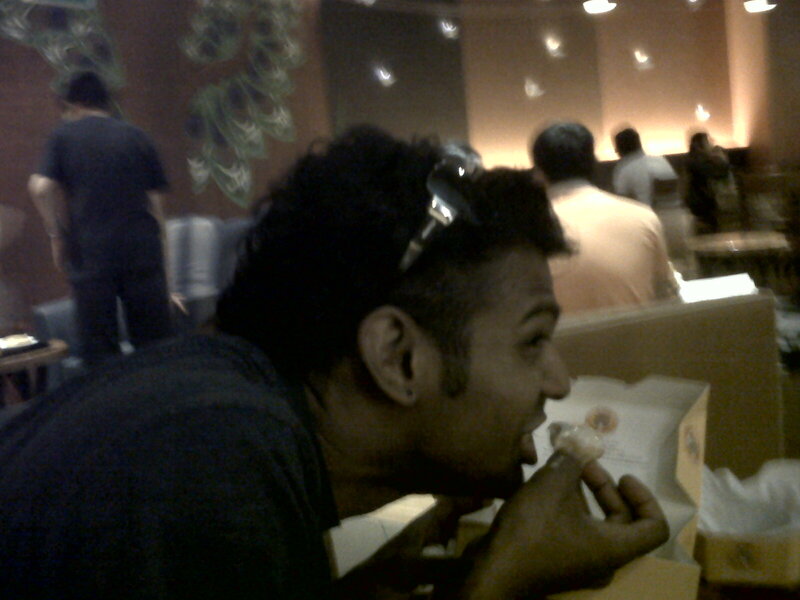 Another trip to enjoy food! This time I went to a restaurant with my ex-roommate, Windy, and her husband. It was a brunch of Nasi Kuning, special menu from Banjarmasin. It was a great time to meet old friend, even though it was very short. My mom called me up and asked me to be the ‘driver’ for my aunties! 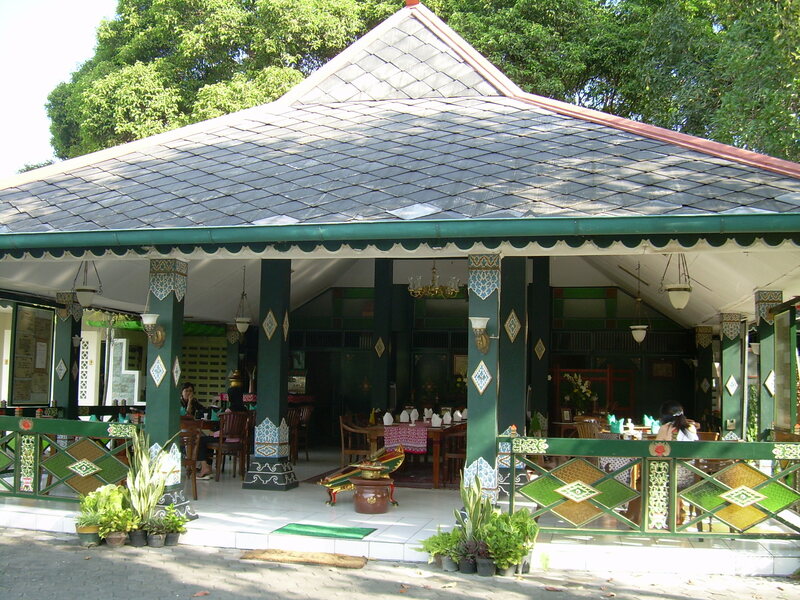 We had another invitation to attend … Lunch at seafood restaurant, called ‘Pondok Ikan Bakar ASIAN’. The food were tasty and made you want more. I didn’t touch the rice and just tried the food here and there. I was so full after a plate of Nasi Kuning. Journey continued … with another food searching! So, after I went for Sunday mass, I went to a friend’s place with my cousins. We tried the well known snack, called ‘kroket’. It made from mash potatoes, mixed with carrot, beans and chicken. Then it was wrapped and rolled on flour. Deep fried and ready to eat … It had sauce, which made from cucumber and mayonnaise. You may see the picture and taste it! The night was still young … All of us by, 5 girls by then,went for grilled corn and final dinner … pork noodles! 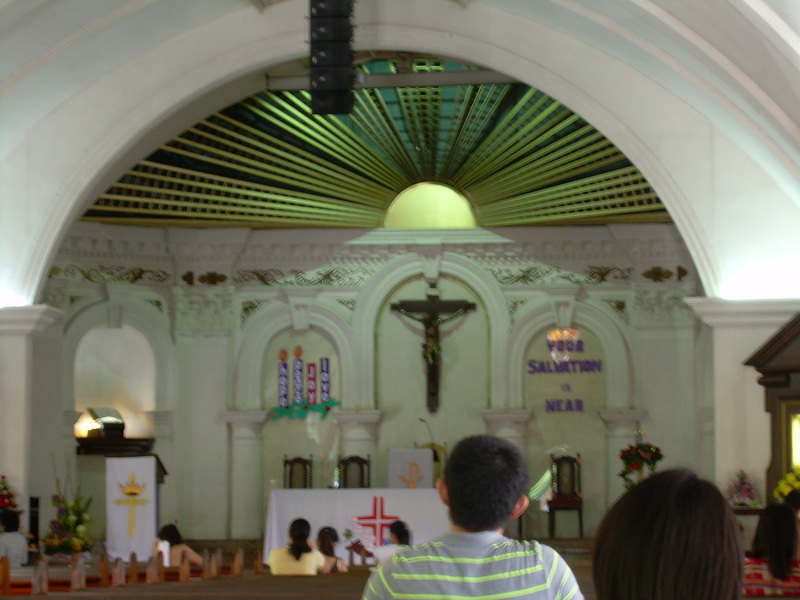 At last, we went for a pilgrimage, to find our soul mates (ehm…) at the Catholic church in town. Well, you can see that my trip was a mix of everything, a bit of that and a bit of this … If I sum them all, they equal with HAPPINESS. My cousin and I started the 1st day with a trip to Borobudur Temple. It took 30 mins of driving from our hotel. We saw an absolute beauty of human creation! So many people were there : Indonesian, Japanese, Caucasian and many more. They talked with different languages but they stunned for 1 thing, Borobudur itself. While we were taking pictures, some students (and some other people) came and asked us to help them practice their English. We agreed, not to be proud of our English but to help them sincerely. My guess was right, they thought that we were foreigners (they said we might come from China, Korea or Japan). When they figured out that we were Indonesian, one of them said, ‘Enough’ in a way to stop the interview. It was kind of rude for me, because we just told them the truth. But, hey, that’s the reality. I’ve been traveled to some beautiful places in Indonesia, and people are nice when they thought that I am a foreigner. They never believe that I’m a just part of them… I’m an Indonesian! But that was okay. We stick on our plan of that day. Next destination was Sendangsono, a famous Catholic pilgrimage in Yogya. The place was quiet and very peaceful. I guess because we went on a normal day, where not many people were there for holiday or holy trip. We prayed in front of Mother Mary statue, as a way of devotion. We also burned our ‘request’ on a big pot (we took a moment to burn out the papers, because the wind was hard and kept on blow out our match). Of course, we have faith that Mother Mary will help us to deliver our prayers to her Son, Jesus Christ. Later that day, we were hungry like the wolf (thanks to Duran Duran). So, after asking around a few times, we had our lunch at Mang Engking. A place of great food, good price and awesome fresh air. We’ve rarely seen such a place near a big city, like Yogya. 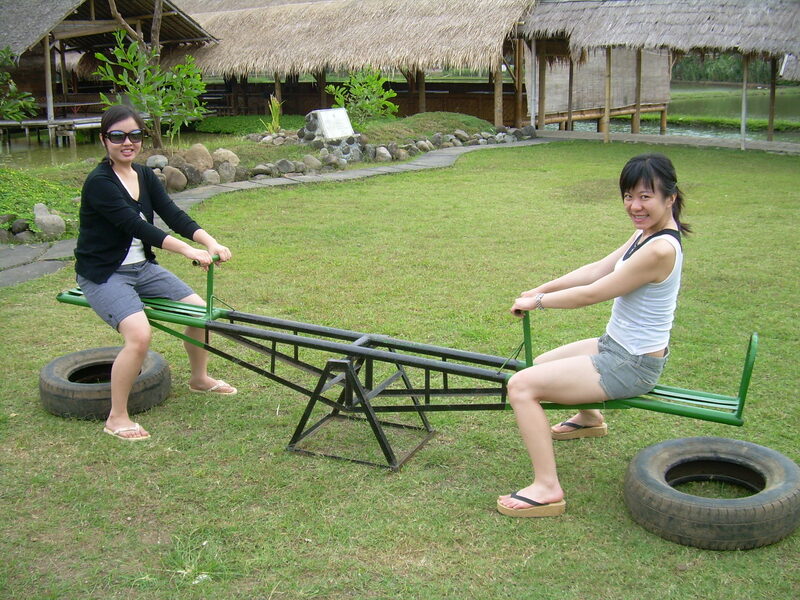 It’s located in a village (known as dusun) and it was perfect for us who always stay in such a big and crowded city. We ate a lot, talked a lot and took many pictures. My cousin was a big fan of being shoot! She was a great company for my trip to Yogya! We spent the afternoon by watching the clouds covering Mount Merapi (so sad we missed the view!) in Kaliurang. The weather was good, chilly and cloudy (according to us, it was better than a hot sunny day). We climbed the tower to watch around. Not so many things to look around though. So, it was a short trip to Kaliurang… then off we go to Malioboro. We had a bad dinner of Nasi Gudeg because we chose the wrong food stall (we learned from that fatal mistake). But overall we had such a great shopping time around Malioboro. Batik are everywhere! Oh, we bought Yogya’s lumpia that has been said to be better than Semarang’s lumpia. Well, we liked it! The taste was different than any other lumpia that we ever had. How good was it? 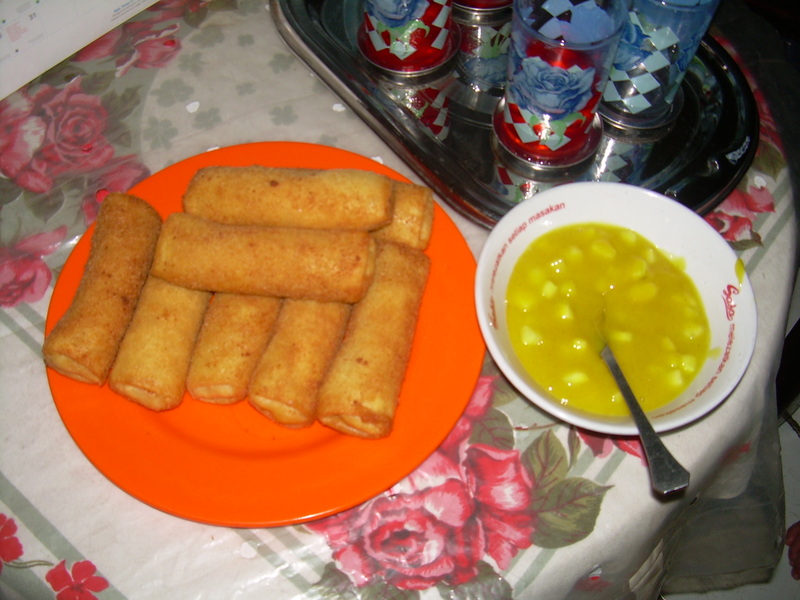 You should try by yourself… I don’t know how to write the feeling of eating lumpia in words. Sorry for that! Keraton Yogya was our 1st destination that day. We walked around Keraton for about 30 minutes with someone that introduce himself as a guide. He explained everything about the old days of Keraton, the wedding ceremony, many Javanese tradition that still happening in the Keraton and also the formal dress for every ceremony. He treated us nicely until we refused to buy paintings in a shop nearby. Well, it didn’t screwed up our day… we were still having fun after that! Shopping time at Pasar Beringharjo! It was a great shopping time … Both of us bought some Batik dress and jewelery. The price was good, because we can bargain with the seller. Once again, many people thought that we were foreigners. A lady who sold Batik dress to me asked how long have we been in Indonesia, because our Bahasa is very good. When I told her that we are Indonesian, she was in disbelief. We were just smiling then. 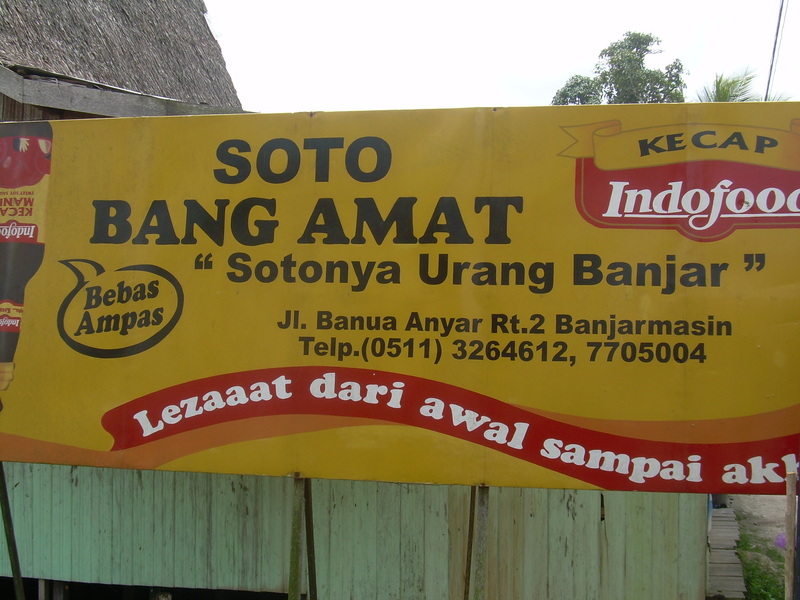 Then… we continued our trip to a nearby place to buy Bakpia Pathok and some Ketan (made from rice). Those were traditional food from Yogya and you should try them when you go to Yogya. Worth a try. Even my cousin who has never been to Yogya before liked it very much! Leisure time was coming next. We went to Benteng Vrederburg. An old Dutch building that is used as cultural center. Many stalls were built that day, because they had Yogya Fair this June. They sold dress, hand made jewelry and T-shirt, photo frame, accessories and many more. Our main purpose was to watch Penginapan Bu Broto (Mrs. Broto’s Hotel) movie. It was a classic Indonesian movie. For me, it was kind of reminiscing the old days… when I was in Primary school I watched the serial in national TV station. For my cousin, it was her 1st experience of watching such movie. Because she’s been away from Indonesia since she was 9 years old. We both liked it! Now, the real culinary journey just begun! We had dinner in 3 different places within 1.5 hours. First experience for me and I don’t think I would do that again. I felt like I wanted to blow up…. At first, we bought Oseng-Oseng Mercon Bu Narti at Jl. KHA Dahlan. The place was crowded by young people who eat with ‘lesehan’ style. We didn’t eat there because we saw a rat running from under the table just before we started to sit. So, we decided to buy the oseng-oseng and drove to Nasi Goreng Beringharjo (yup, near the market that we went earlier). Both stalls open in the evening. After a long waiting, we finally ate the fried rice! It was totally delicious. The portion was big, even after I shared it with my cousin, we still feel so full… and satisfied! As if haven’t full yet, we drove off to Nasi Gudeg Bu Widodo at Jl. Wijilan. It was an area of Gudeg in Yogya. So, you will see many Gudeg Restaurants along that street. Now, we had a great Gudeg. I didn’t eat though. Just having a bite or two from my cousin. I was really too full to open my mouth… It was good to know that my cousin pleased with this Gudeg. Then we went back to the hotel… to pack our things. It was our last day of Yogya trip. What a sad goodbye-hug! I’ve sent my cousin to the airport. She went to Jakarta and Singapore afterward. I went home with my driver… The Yogya’s trip was over. But we still have plenty of plans for the future years. My dear cousin, I will definitely miss you! I am very proud on you. Your trip experience was really wonderfull. I am completely deeply affected. The meeting with the pupils was a unique experience. I ask myself, why think they always still in such a way? But I can understand well, since they have still such conception. The social situation likewise coined/shaped it. It is important to me to deal with such situation well. It can enrich us our life spectrum. This experience is also a deep invitation at us to get along with the life. I thanks you for your courage to communicate to us such experience. God bless you!!! After reading about our trip, I realized how much I missed you. Travelling with you has made me learn more about my country & most importantly, about you. You are so much fun to be with & extremely understanding & has a very kind heart. For those who have met my cousin- Evi, I am sure you will agree with me. And for those who have not met her, it will be a blessing to have her as your friend. It definitely has been a very good trip. I am very amazed by you. May God continue to help you grow in Him.